For the last nine months it was rather quiet around UK Sounds Amsterdam. After a smashing 1st year anniversary in Studio /K together with their friends from Deep House Amsterdam and four astonishing editions prior to that, they felt the need to look for that perfect location before they made a come-back. Once again featuring a line-up with the best UK and NL have to offer of course. As for UK Sounds, their vision is that quality is always more important than quantity. From time to time you may have visited one of their events, label-showcases or release parties, such as the one during ADE where they delivered a great showcase at VLLA with the infamous Manchester based label ‘Music is Love’ run by Oli Furness. Location-wise, UK Sounds has high standards, strictly throwing parties in warehouses, industrial buildings, basements or sky high locations. What they needed for this edition is the Dhoem Dhaam Project, a place that feels like a new home for these guys. For their return on Friday the 27th of december, they teamed up with Jongens v/d Wereld and mediapartner deephouseamsterdam.com and as expected, they took their line up to the next level by offering the best the UK and NL have to offer. For example, Waze & Odyssey iss their headliner. These guys have played at places like Berghain/Panorama Bar and hit The Warehouse Project in Manchester later this year. 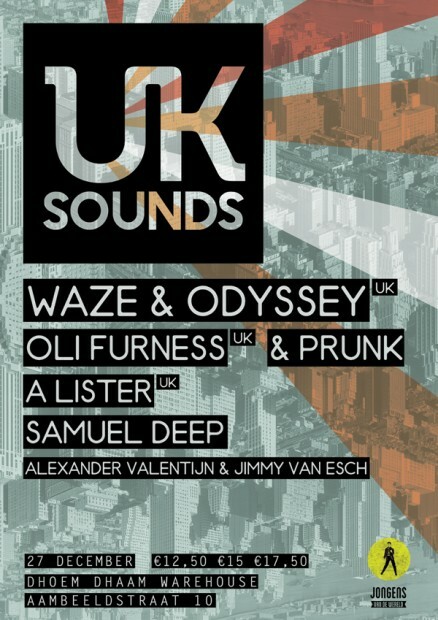 Furthermore, Music is Love label boss Oli Furness and Double Tree Records owner and man of the moment Prunk will team up for a special b2b session, while the rest of the line up consists of Samuel Deep (Slapfunk), A-Lister (Love Not Money) and residents Alexander Valentijn b2b Jimmy van Esch.